The following comments about attractions in Brighton have been posted from individuals. We believe that the best reviews of Brighton, England are written by travellers and holiday makers who have experienced Brighton first hand and want to share their thoughts. Can you share yours? Please help us expand this section of our Brighton World Guide. 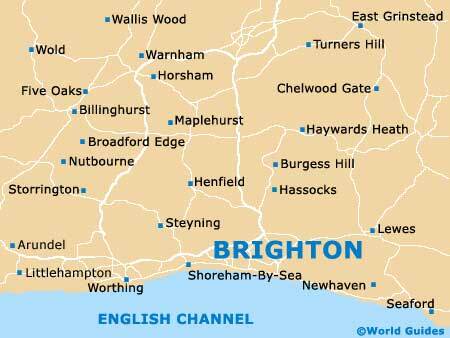 Let us know what you think about the attractions in Brighton, England. Submit comments about Brighton attractions here. Brighton Bike Tours is a really fun way to sight see Brighton. We cycled the whole city hearing about the history and it was great fun. We saw and heard about the Royal Pavilion, West Pier, haunted Preston Manor, St Bartholemews Church and lots more. the tour was an easy 2.5 hours long with a break in the middle. It is a greatly enjoyable fun and fact filled Brighton tour and highly recommend it to anyone visiting the city. In the winter I went on a holiday to Brighton and visited the Royal Pavilion. The Royal Pavilion is a brilliant sight and its ice skating ring is amazing, especially at night. But there is a let down, you aren't allowed to take photos when you get inside. This is a must see. When I first saw the Brighton Royal Pavilion I was so gobsmacked. It looked like it had come right out of an Indian fairytale. It was so lovely and was built at the start of the 1800s for Prince Regent. We didn't mind the queue, because the sunny was shining, the flowers were out and we were on holiday. The is a great pleasure pier and everyone coming to Brighton has simply gotta come here. I still can't believe how far out it goes - very long. It was swarming with people and a very typically British seaside thing to do. The shops there were selling all the usual junk, and the funfair was a bit of a ripoff, but the small roller coasters looked fun. It is now over 100 years old, and it is beginning to show its age. The gardens around the Brighton Pavilion were absolutely gorgeous - I've never seen such lovely holihocks. They were fab. We joined the people sitting around in deckchairs and soaked up some sun for an hour - boy was it hot that day! And - it was all free. English summers are always quite unpredictable, but that is really all part of the fun, really it is. When we came to Brighton, the weather one the whole was pretty good. We had a lot of sunshine and spent the best days on the beach. I braved the cold waters for a quick swim, very quick! On the days that weren't so good we did things inside. I think it;'s a really good thing to plan you holiday around the weather if you can - very sensible. You might hit lucky though and have a fortnight of solid sun. Please note that these Brighton, England comments and reviews are posted by individuals and are not necessarily the views of World Guides.